I made this low-medium poly 3D model recently entirely in Blender and it is not textured. As you can see it is only colored somewhat with different materials. There are two versions of it in the zip file that you can download at Deviantart, one is like this cause the mesh has been more divided for the coloring and markings (done directly in the mesh) and there is a complete white version with the mesh more clean for texture mapping. 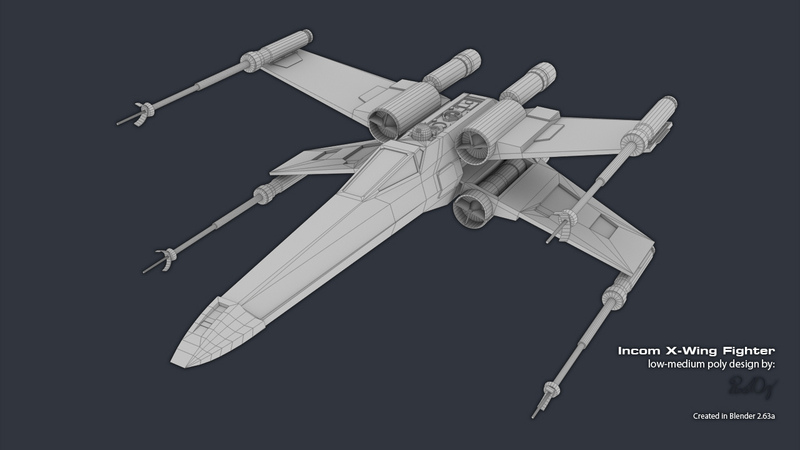 I always wanted to model an X-Wing and I really tried a bit hard to get the proportions of the ship and the basic shape right and that is not easy for one particular reason, it is not easy to find good quality blueprints of the ship specially for free. There are lots of photos of the original ship models on the web but most of those are pretty bad and there are some pretty good photos of very high quality prop replica models (models created to try to be as close as possible to the original studio scale models) out there but which one do you trust? Which one is really close to the original models and how much? Many of these photos and the relatively low quality blueprints available out there have a lot of discrepancies in many things. And most photos are at an angle and even those that are taken directly from the models sides, top front or any other perpendicular angle to the ship are affected by perspective and lens distortion and believe me even with the best ones of these there are a lot of things that get out of place. And there are ways to compensate for some of these problems but it is still somewhat limited in scope. Official good quality blueprints are kinda difficult to find and anyway they are expensive so not everybody can afford them. So what do you do to make an accurate 3D model? What I did was to make a sort of consensus from the best reference material I could find on the web for free. The best material I could find for free on the web came mostly from the RPF (The Replica Prop Forum - http://www.therpf.com/) which is a forum where people gather to share information and reference material and experience in order to build replicas of the props used in movies as close as possible to them. I thank the people there for all their hard work cause it helps for these things a lot. And I also found some in other places. 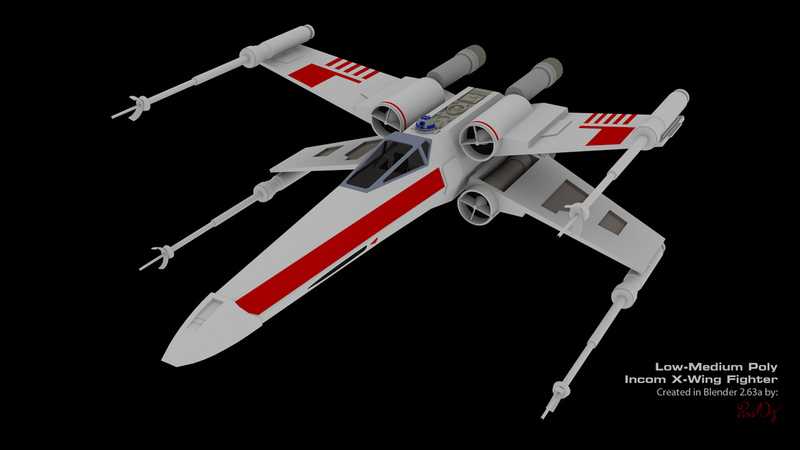 Remember that it is low poly and many compromises have to be made for such 3D models. I know that with textures it would look much, much better. I originally designed it for the AC3D screensaver. There is another submission right there in Deviantart where you can download my mods package for the AC3D 3D screensaver with many models that you can use with it. Many more details about the model are specified in the PDFs included in the .zip file. 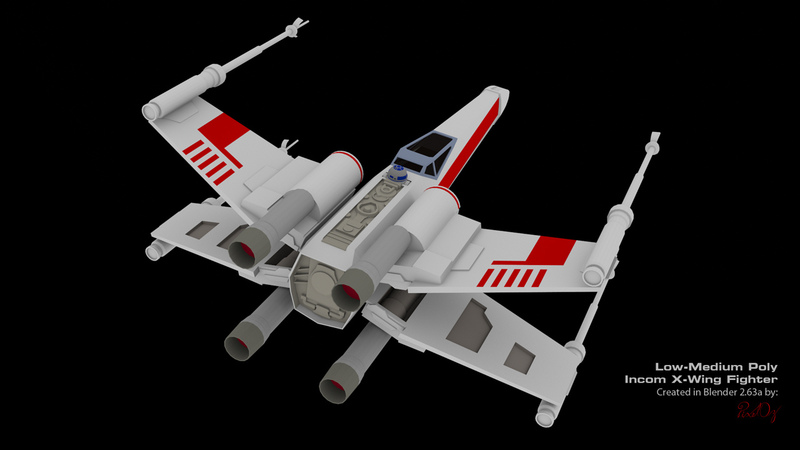 The model is completely free and you can even use it for commercial purposes. The complete details and restrictions are specified in the accompanying PDF documents.